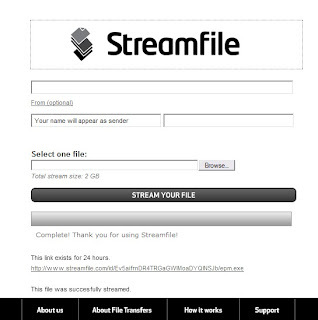 Streamfile is a new file hosting that allows you send a big file to somebody, but it has a special platform for file transfer to each other. It is a kind of P2P, when you upload file and receiver can download at once. I could not find any other information except this company based on Stockholm but website registered on US, it does not say any about how long that file you uploaded stay on its server, only say 2GB available and the service subscription starts 49€ per month. After I test I found my uploaded file only stay its server 24 hours. You can download file almost at once after it gave you a download link. The service seems free but what does subscription fee mean? The file transfer is encrypted.